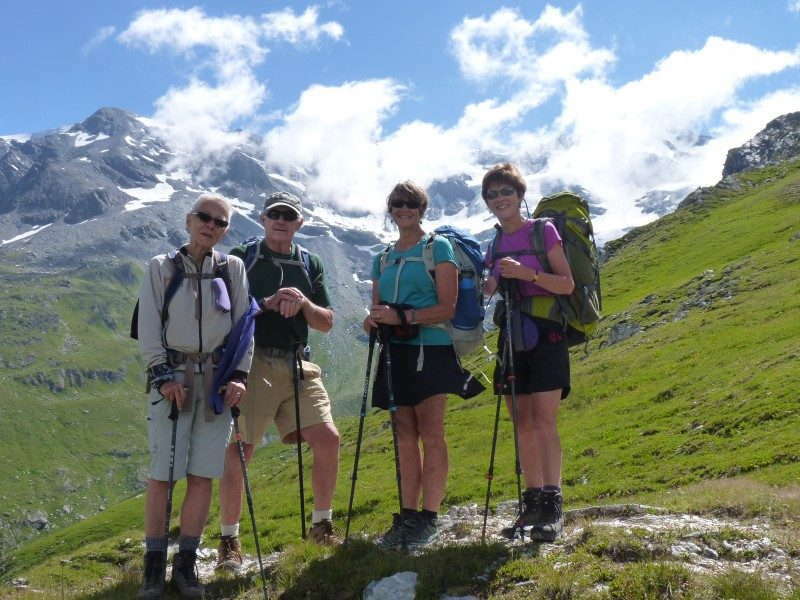 6 days guided hut-to-hut trekking in the Vanoise National Park, France. See ibex, chamois and perhaps a Bearded Vulture. 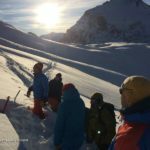 Benefit from Mark’s local knowledge of the Vanoise. Alpine flowers and wonderful views. 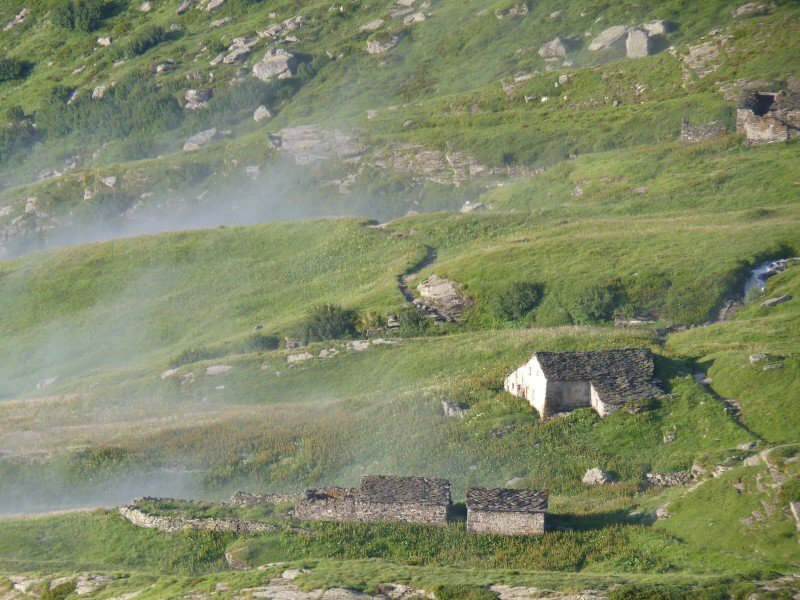 This Tour of the Vanoise is 6 day guided hut-to-hut walking holiday in the Vanoise mountains starts and finishes in the charming village of Pralognan-la-Vanoise; or Pralognan for short. Pralognan is one of the “gateways” to the Vanoise National Park. Our first and last nights will be spent at the friendly, family run Hotel Grand Bec*** in the heart of the village. The hotel has its own outdoor heated pool surrounded by the peaks of the Vanoise. I am the only non-French “Accompagnateur” (International Mountain Leader) to be recognised as an “Ambassador du Parc” which demonstrates my knowledge and commitment to the Vanoise National Park. Read about this trip on Thirdeyemom’s Blog with some excellent photography. Our route, having left the valley at Pralognan, stays high in the mountains until our return at the end of the trek. In fact having left Pralognan we do not drop below 1700m until we descend to the village on our last walking day. 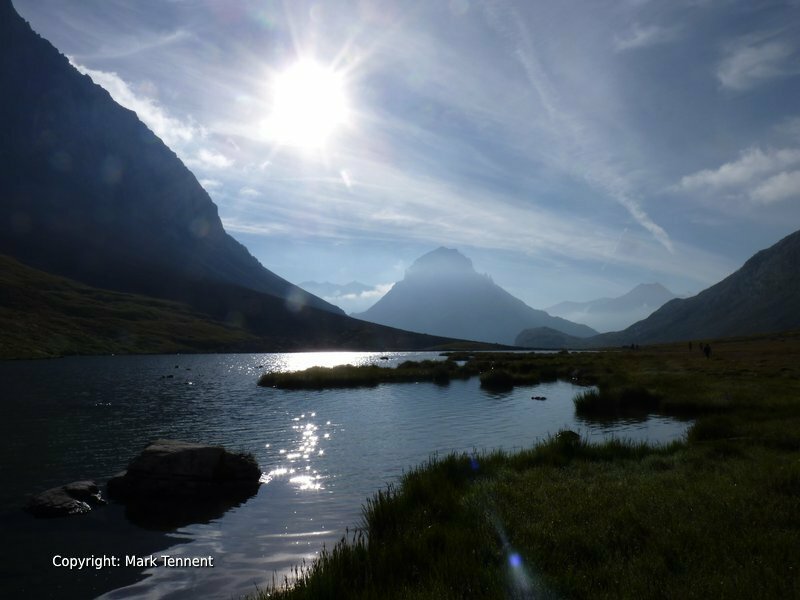 Almost our entire time is spent within the heart of the Vanoise National Park, protected from intrusive development and inappropriate use. We only touch a surfaced road to cross it a vast cry from some popular treks. Keeping us company on our trek is the Glacier de la Vanoise, a constant companion reminding us we are in the high mountains. Our first and second days see us pass below the highest mountain in the Vanoise, the Grand Casse (3855 m). Tumbling mountain streams make their way to the deep valleys below filled with melt water from the glaciers. 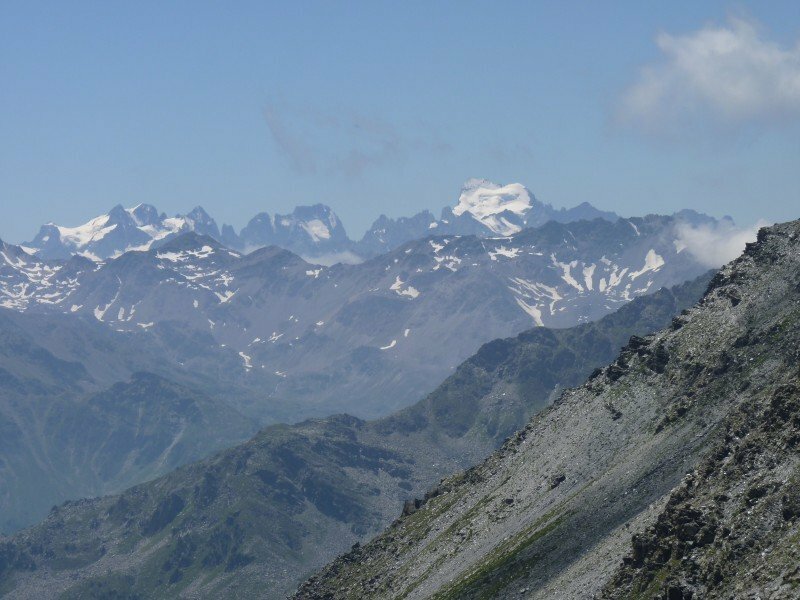 Our views extend to the mountains that run along the Italian frontier and southwards to the high peaks of the Ecrins National Park including the Barre des Ecrins and the Meije. The highest point on the Tour of the Vanoise is the Col de la Chaviere (2796 m) as we say goodbye to the Maurienne valley and cross back to the Refuge Peclet-Polset. It it may be possible to climb the Col de la Masse (2923m) depending on the group and weather close to the Rateau d’Aussois (3021m). 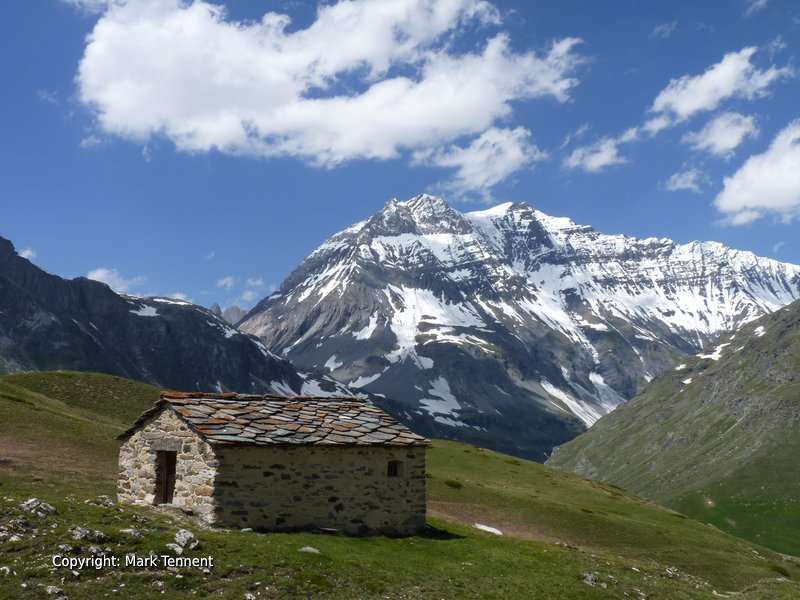 After leaving Pralognan we will spend the next five nights of the Tour of the Vanoise in mountain huts (or refuges) where the guardian and his hard-working team provide accommodation and a substantial dinner. Good wholesome cooking in a convivial atmosphere. Staying in a refuge is an experience and allows you to experience that special feeling of being in the up in the mountains as the sun sets and the stars appear. The refuges are also places to meet fellow walkers and in some mountaineers, rising in the early hours, to climb the surrounding peaks. Early in the season, after the winter’s snows melt, there’s a kaleidoscope of wild flowers. Edelweiss, gentianes, genepy, and a host of other alpine flowers carpet the alpine meadows. The Vanoise is currently home to three pairs of Bearded Vultures (or Lammergaiers) with wingspans approaching 2m 80cm – an impressive bird! 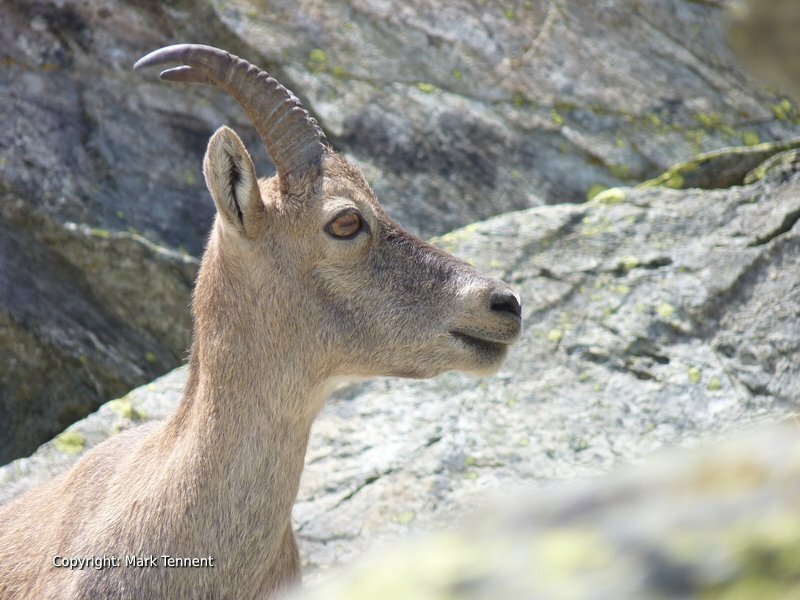 The Vanoise is also home to an increasing population of ibex saved from near extinction in France by the creation and the protection of the Park. 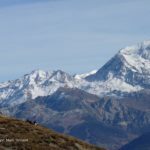 There’s every chance of seeing this icon of the Vanoise and knowing the best places to find them helps. The graceful and extremely agile chamois is more elusive but they too have their favourite haunts. Of course no visitor to the Alps will go home without having encountered the endearing marmotte. Man has shaped the landscape of the park and old alpine chalets, with stone slab roofs blend into the mountainside. Agriculture continues within the park and its presence maintains the high alpine pastures, home in summer, to herds of “tarine” cows. The cows are milked where they graze and the milk goes to make the famous “Beaufort” cheese. You will have the opportunity to watch the cheese being made at one of the farms over an open wood fire if we arrive at the right moment. D1 – Arrival and settle into the hotel. A chance too, to explore the village of Pralognan nestled at the foot of the surrounding mountains. D2 – A gentle day ascending to the Col de la Vanoise (2516 m) from Pralognan-la-Vanoise along the ancient trading route; the “Route du Sel et de la Fromage”. Walking through the village from the hotel we start climbing slowly between old stone houses. To our right is the waterfall of the “Cascade de la Fraiche” thundering between steep rocky walls. The strengthening sun warms the pine woods and the smell of pine resin rises to meet us. 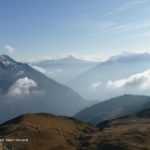 At the Barmettes we cross the stream that tumbles down the steep walled valley and we cross the boundary into the heart of the Vanoise National Park. The route onward is bounded by low, dry stone walls. The “shark’s fin” of the Aiguille de la Vanoise imposes itself to our right. Soon we reach the very shallow Lac des Vaches. We cross on it’s stepping stones amongst the reflections of the surrounding peaks. It makes an idyllic picnic spot to taste fresh bread, local cheese and meats. Onwards into the high mountains, glacial moraines bearing testimony to the glaciers that shaped this awe-inspiring landscape. Passing the moraine below the Grande Casse and the shores of Lac Long we soon arrive at the broad Col de la Vanoise and the refuge Felix Faure, named after the 7th French president. The col is a magnificent, breathtaking place. For those with energy to spare there’s a chance to explore the area around the col and may be spot ibex, chamois or find the emblematic edelweiss. Time: c. 4 hrs Ascent: 1100m D3 – Col de la Vanoise – Refuge de l’Arpont. Early morning light accompanies us as we descend gently past small lakes. Immense scree slopes rise up to our left to the Grande Casse as we pass Lac Bond and the Lac du Col de la Vanoise. To our left the Pointe de la Rechasse marks the eastern extremity of the Glacier de la Vanoise. Ahead lies the entrance to the Vallee de la Leisse and the Vallon de la Rocheure. The ground steepens and we pass an ancient fortification guarding this strategic point. Steps, hewn from the solid rock, bring us to a junction in the path. 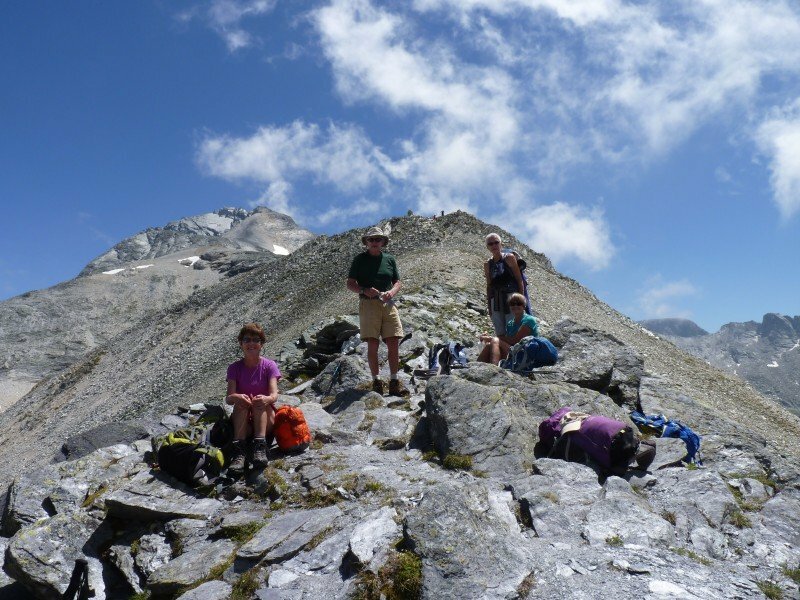 We traverse round the rocky hillside still above 2300m and reach the Lacs des Lozieres. The Glacier du Pelve moraines provide a change of scenery and we cross a torrent issuing from its snout. Above us now the Dome de Chasseforet (3586 m) and below a deep cut gorge that leads down to the village of Termignon in the Maurienne valley. Turning a corner in the path we come across the Refuge de l’Arpont (2309 m) and a welcome from Valerie, the guardienne. Time: 5 hrs Ascent: 550m – Descent 750m. D4 – Refuge de l’Arpont – Refuge de la Dent Parrachee. Today’s walking is dominated by La Dent Parrachee (3697m) whilst opposite we look across the valley of the Haute Maurienne and the Italian frontier. In summer the Col du Mont Cenis provides a road crossing into Italy and the town of Susa. The flanks of the Dent Parrachee are traversed passing old shepherd’s huts and we may well come across large flocks of sheep. These flocks, watched over by their shepherd, are brought up into the mountains for the summer months before descending in the late autumn to warmer climes. A small plateau leads to a switch-back descent amongst spare pines. Eventually we arrive above the village of Aussois and two lakes, the Lac d’Amont and Lac d’Aval. There are several refuges in this area but my preferred is the Refuge de la Dent Parrachee (2517 m). Franck, the guardian, is the master of ceremonies and presides over his hut ably assisted by Kapitan, a Nepali Sherpa. The refuge is the stepping off point for mountaineers climbing the higher peaks and glaciers including the Dent Parrachee. The terrace in front of the refuge has a wonderful panorama for a pre-dinner drink. Time: 7 hrs. 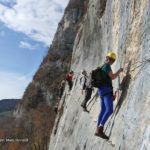 Ascent: 1200m – Descent 100m. D5 – Refuge de la Dent Parrachee – Refuge de l’Aiguille Doran Choices, either the “normal” route via the Col du Barbier or the high route via the Col de la Masse (2923m). Either way the scenery is stunning. Dropping down from the “eagle’s nest” of the Dent Parrachee we reach the parting of the ways a short way above the Plan d’Amont. Onwards via the Col du Barbier we share the path with the GR5 long distance path heading for the Mediterranean. Soon, for the first time since leaving Pralognan we pass below the tree line. Birds, may be a Casse-noix moucheté (Spotted nutcracker) that feeds on the pine nuts, flit amongst the trees. Once more we smell the aroma of pine resin. Finally we come out into a clearing and the welcoming Refuge de l’Aiguille Doran. You can expect to be delighted with Fabienne’s cooking that would do justice to any restaurant. At 1860m this is the lowest point on the trek before the final days walk to Pralognan (1418m). Time: 5 hrs Ascent: 300m – Descent 600m D6 – Refuge de l’Aiguille Doran – col de Chaviere – Refuge Peclet-Polset. We turn our backs to the south and the Maurienne as we turn uphill. Two options present themselves today either passing by the hamlet of Polset or passing the refuge de l’Orgere. If we pass the refuge de l’Orgere we pass through hayfields in the valley de l’Orgere, so-called as oats were once grown in this sheltered valley in days gone by. We cross the only tarmac that we will encounter until our final day before a zig-zag path gains height steadily through open woods. Clearing the woodline the path describes a rising traverse with the Aiguille Doran’s (3041m) spiky summit above us. The ground flattens amongst large erratic boulders and we may divert to the shores of the Lac de la Partie to enjoy our picnic. For the brave, or daft, the possibility of a quick, very quick, dip in its waters! Ahead lies the Col de Chaviere marking the watershed with the river of the Doran de Chaviere the other side. The col despite it’s altitude is easily attained although late winter neves sometimes linger. From the col you can see Mont Blanc on a clear day. 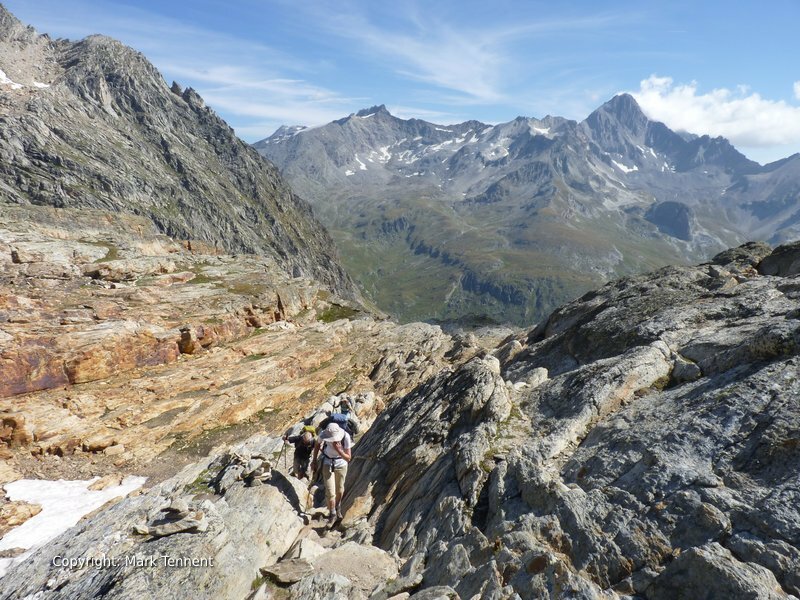 A short, steep descent on less stable ground brings us to an undulating chaos of moraines. Sometimes we quit the path to seek out the preferred haunts of the ibex. The refuge Peclet-Polset is large and modern since the old one burned down in a fire. We can make a little extra excursion to see the turquoise waters of the Lac Blanc below the Col du Soufre and the Dome du Polset (3328m). Time: 6 hrs. Ascent: 1080m Descent: 450m D7 – Refuge Peclet Polset to Pralognan la Vanoise. Our final day is a long gentle descent alongside the tumbling waters of the Doran. The valley provides pastures for several herds of cows and a farm where there’s a chance to see cheesemaking in progress. Leaving the farm we pass the luxurious Refuge du Roc de la Peche, complete with jacuzzi. Here, if we wish, we can take the path for the Cirque des Nants, or carry on down the bottom of the valley. We reach the hamlet of Prioux and a small road, shut in winter. We take a track on the opposite side of the valley before crossing a bridge to follow a track through pine woods that brings us out right in Pralognan itself. The Hotel Grand Bec welcomes us once more and there’s a chance to relax in the pool or take a well-earned drink on the terrace. Time: 5 hrs Descent 500m. D8 – We say our goodbyes to the hotel after breakfast. 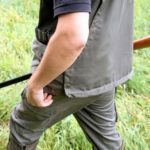 Insurance – please see my links page. Drinks – except tap water.